A beautiful colourful oil on canvas portrait by Annie Louisa Robinson (Swynnerton). She was a founder member of the Manchester Society of Women Artists and the first woman for 200 years since Angelica Kaufmann to be given Royal Academy ASRA. Painted in Roma in 1874 it is titled verso Jebsa. The painting was later presented to the Prior Park College. 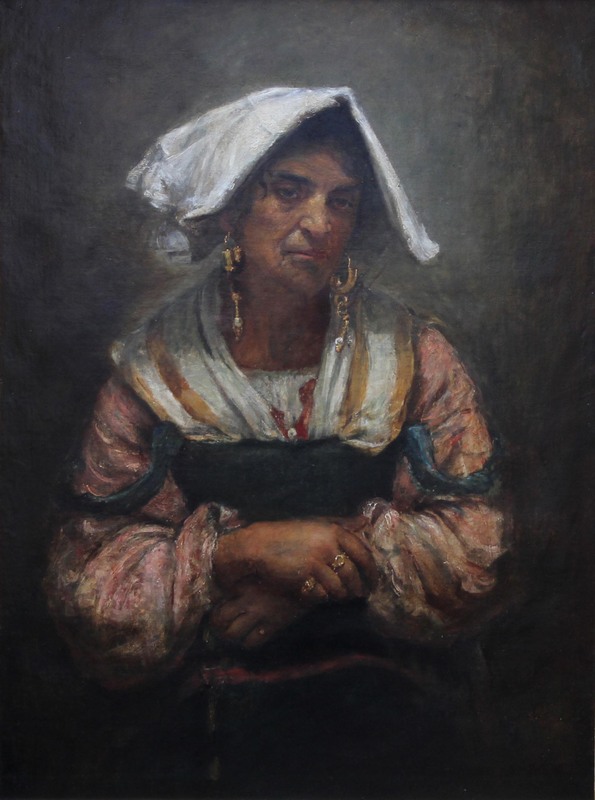 It is a fine quality Victorian portrait of a striking Roma woman in traditional dress, in its original frame in good condition. The painting has had restoration in the past and been relined. Currently on loan to Manchester Art Gallery as part of their Swynnerton exhibition. POA. Signed bottom left and signed and titled verso. Swynnerton was born in Kersal, near Manchester, one of seven daughters of Francis Robinson, a solicitor. From an early age she painted watercolours to supplement the family's reduced income, but began her serious training as an artist at Manchester School of Art, before leaving to enrol at the Académie Julian in Paris. Her work was first exhibited at the Royal Academy in 1879, and the following year she exhibited a portrait of her friend Isabel Dacre (Manchester City Art Gallery), with whom she later formed the Manchester Society of Women Painters. Swynnerton completed her studies by travelling for two years in Italy. During a stay in Rome she met the Manx sculptor Joseph Swynnerton, whom she married in 1883; until his death in 1910, they lived mainly in Rome. Whilst in Italy, Swynnerton painted works such as An Italian Mother and Child (Manchseter City Art Gallery) in a style clearly reminiscent of Renaissance painting, and panoramic landscapes such as The Olive Gatherers (Manchester City Art Gallery). In 1902, after a gap of sixteen years, Swynnerton exhibited again at the Royal Academy. Always greatly admired by other painters, her work was bought by prominent figures in the art world. In 1906 Sir George Clausen purchased New-Risen Hope, depicting the figure of a naked child, and later presented it to the National Gallery of Victoria in Melbourne. John Singer Sargent bought The Oreads in 1907, a sculpturesque group of sea-nymphs, giving the painting to the Tate Gallery, London, in 1922. In addition to her allegorical paintings, Swynnerton exhibited many portraits at the Academy in the 1910s. In 1922, backed by Clausen and Sargent, Swynnerton was the first woman to be elected an Associate of the Royal Academy. The only previous women to rank as Academicians were Angelica Kauffman and Mary Moser, who were signatories to the Instrument of Foundation in 1768 and thus were made members without being elected. The year after her election there was an exhibition of her work at Manchester City Art Gallery and another version of New-Risen Hope was purchased for the Chantrey Bequest in 1924. In 1929 and 1930 two more works were purchased for the nation this way. Swynnerton's sight began to deteriorate towards the end of her life, but she continued to exhibit pictures at the Academy, although they were often works she had painted years earlier. She died at the age of eighty-eight at her home on Hayling Island, near Portsmouth.